I don’t think I can ever get enough black & white. It’s the definition of classic and can be done in endless combinations, prints and styles. 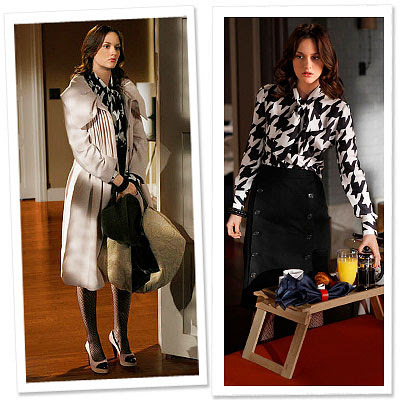 Gossip Girl’s Blair Waldorf always dresses so ladylike and this outfit is no exception. This top could be recycled for years and still be fresh each time. Blouses have been at the top of my list lately and this black and white Alexander McQueen houndstooth version is right up there. I love it with the Brooks Brothers skirt and I could definitely see myself sporting this look to work. So cute and you know the top just wouldn’t have the same effect if were any other color combination. « Miley’s at the Beach!